While the land question from the mid-Victorian period to the eve of the First World War plays a prominent role in Irish historiography, historians have tended to overlook its importance in post-independence Ireland and have generally assumed that there was no land question after 1922. Terence Dooley debunks this myth. In this first systematic analysis of the land question in independent Ireland, he contends that agrarian agitation proved to be an important stimulus to political revolution during the period 1917 to 1923. He assesses the dangers which agitation posed for the Provisional Government after 1922 and argues that the 1923 Land Act not only ended agrarian agitation but also made a major contribution to ending the Civil War. 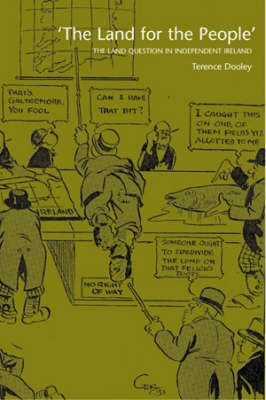 Dooley emphasises the significance of Irish Land Commission to Irish rural life in an extensive analysis of the working of the Land Commission after its reconstitution in 1923. The commission became the most important (and controversial) government body operating in independent Ireland. It acted as a facilitator of social engineering, compulsorily acquiring lands from traditional landlords, large farmers, graziers and negligent farmers and passing them on to smallholders, ex-employees of acquired estates, evicted tenants and their representatives, members of the pre-Truce IRA and the landless. It migrated over 14,500 farmers onto lands totalling almost 400,000 acres. The continued hunger for land and the impact of land acquisition and division on so many people ensured that the land reform question remained one of the most potent political issues until the early 1980s.